Last year I wrote the message below in a newsletter article. I am going through some of my files from last season and as I read through the comments many of you made, my heart swelled with appreciation and joy.Together, you each encourage me so much, but you also encourage each other and so I wanted to share your comments here so others can relate and be comforted. I don’t share this to glorify myself with your kind compliments, bur rather to encourage you to allow yourself to admit when you are struggling. Because see what happens? I am no different than each of you. Our story of faith and illness together is an amazing testimony. Carefully choose who to reveal your challenges with, but be willing to take of the mask off, the one behind which you may pretend everything is okay. Your transparency and willingness to share that you are in pain. . . but STILL trust God completely, is more of a witness to our Lord than anytime our life is at ease. To be honest with you, I am not in a place right now where I am shouting about God’s goodness from the mountain tops. I know I should be, because He is Holy and should be praised regardless of our emotions. But I am in a place where I am emotionally kneeling before Him with my head resting on my hands, and just waiting. I am overwhelmed with His presence beside me, and yet I do not hear His voice. I just barely feel His light touch on my back. Whether you are passing through deep waters, or walking through flames right now, He is with you and I. There is no answer other than to simply cling to God. Cling to Him. Nothing in this world will make any sense, but at least together, we know that we are not alone. He will not allow the flames or the waters to touch us. Can I tell you something? That was the most refreshing thing I read. You see, when I was diagnosed with Parkinson’s the same week that my dear dad died, that was not the low point. It was when I ceased hearing God’s voice in the way I had been accustomed to for over 30 years of walking with Him. I felt so abandoned, even though I knew the Truth–that He would never leave me nor forsake me. Except for a few brief times, it has remained that way. Perhaps He is training me to walk by faith and not by sight (or inner sound?) I have acclimated to the silence, of sorts, and am at peace with just trusting and resting in Him. I have ceased striving and am learning to understand, in a deeper way, that He is God. ~K. Thank you so much for this note. Usually your writings leave me very upbeat and filled with joy, but I have to admit there are tears flowing now. Gentle tears, but this note hit me at the very core of my being. Our roads are very long and rough, and even though we believe in the faithfulness of God, the stones still hurt, and we still get very tired along the way. Thank you for reminding me I am not alone in this journey. There are lots of us who go through this and God is always with us and will never let us down. Even if I can’t shout for joy, I can be quiet and wait for God’s touch. Thanks for continuing to share so much of yourself and your journey with us. Will continue to keep you and Rest Ministries in prayer. ~R. I am sorry for all that you are going through. It is amazing that no matter how much physical difficulty and emotional pressure you’ve been under, that God gently uses your mind and hands to be able to minister to us and be an ENCOURAGER to us. Don’t we wish we could touch the tip of Jesus’ robe like Mary did and be healed? But as we know, His healing comes in many disguises, and not as we envision them. God’s mighty hand be upon you and heal you. Bless you for all you are to your family. If people have to do read a little less of you because you need to be there for your kids, that is where you should be. ~J. Thanks SO much for this message to us this morning, Lisa. I REALLY needed it. The fibro pain and fatigue is going crazy, and I’ve had a week of migraine headaches and just feel like things are falling apart. All you do means SO, SO MUCH, and it means SO MUCH to know that I am not alone and others understand. Thanks SO MUCH, hope that you’re having a GREAT DAY! God Bless! ~B. Your life touches so many people in special ways and God is truly using you to spread His Word that we can trust Him no matter what happens in our lives. Whenever I read a message from you, I feel so encouraged because I become more aware of how important it is to share our struggles and trials and encourage each other. Your ministry is so important and such a blessing. We are all with you as you are going through trials and struggles and you are in my prayers. Know God is watching over you and using you to help our faith grow stronger. Take care of yourself and continue to live one day at a time knowing everything will be OK because we have God. ~P. Lisa, thank you for your openness and honesty. Many of us in leadership roles look to others like we cannot be touched by all the woes that come with chronic disease. Lisa, you are my inspiration with all you do. You do so much for others and I know God smiles down on you! Just let me encourage you that He loves you very much and sees your struggles. I consider you my friend and wish I live closer to help you. ~E. I am not going to say much. I feel like I am just coming out of the pits and I am just enjoying resting in God’s grace and beauty right now as well as the beauty of the Spring. I was touched by your message and I am sorry for your losses and I prayed for you today. I did not know that rheumatoid arthritis could become this difficult this quickly. ~N. You are a precious sister in the Lord and I value your every word! I have so been througgh those valleys too, yet the Lord has NEVER left my side. Every where I turn I see the hand of our Father God. Not always removing us from the storm but always holding our hands and helping us endure till it passes. You’re in a valley of sorts right now. But your mountain top experience is coming! It always does when we finally walk out of the valleys, but while in the valley, take time to just sit at his feet. Your day of shouting is just around the corner! I will keep you in my prayers. Remember you are loved and this experience we have here are but “light afflictions.” JOY will give you strength to endure. Smile, sweetie, Jesus loves you and one day in Glory, we’ll be able to meet up and hug and laugh together. Gentle hugs, Z. Here is my question for you… How can you more effectively use your PAIN and even emotional struggles to encourage someone else today? What does that look like? Is there a neighbor who you know cannot walk well, and you’ve been meaning to go over and say hello? 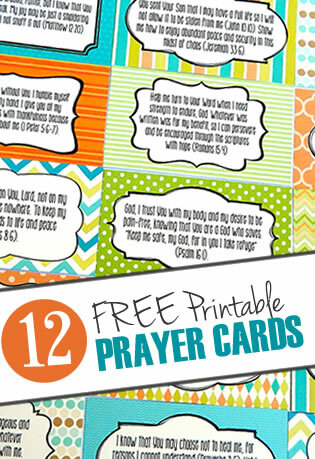 Is there someone you know who would appreciate a phone call from you to encourage him or her? How can you make a difference in someone’s life today–despite your illness or limitations? 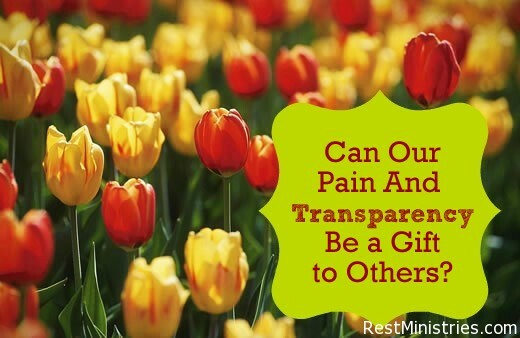 One Response to Can Our Pain And Transparency Be a Gift to Others? Yes!